In response to a request for volunteers from the Leadership Conference of Women Religious, Sister Cathy Olds, OP, served from January 26, 2019, to February 10, 2019, at Nazareth Center, one of nine sites of Annunciation House in El Paso, Texas. The sites offer hospitality for refugees who are released from detention and are on their way to sponsored homes within the United States. Other Adrian Dominican Sisters had answered the call and served at Annunciation House and at the McAllen Respite Center in McAllen, Texas. They share their experiences here. 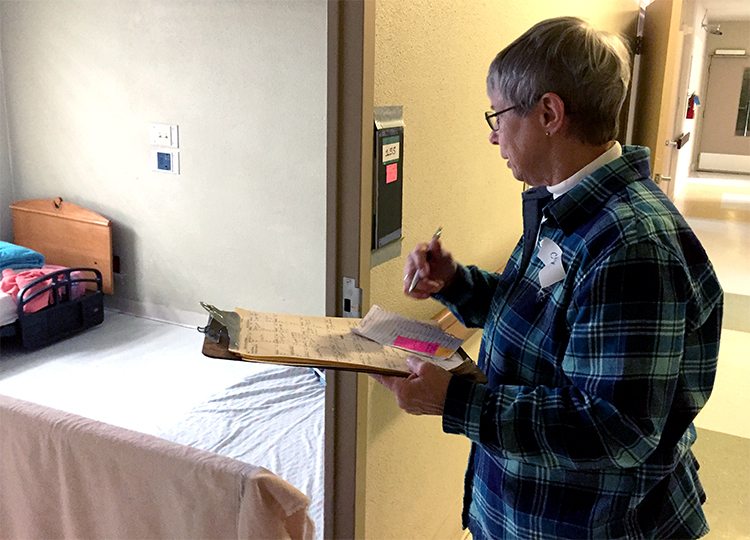 Sister Cathy Olds, OP, checks the bedrooms for guests at Nazareth Center. March 2, 2019, El Paso, Texas – How can one explain a journey that can truly only be understood if personally experienced, a journey of the heart, yet a journey that needs to be shared? It was a journey of exhausting, long days of simply meeting the needs of people struggling for life, seeking asylum from the oppressions of their home countries, and leaving all in hope of a new life for themselves and their children. From January 26, 2019, to February 10, 2019, I made this journey of the heart when I served at Nazareth Center, one of nine sites of Annunciation House in El Paso, Texas. I joined Sisters from several religious communities from across the United States who were volunteering at these sites. Nazareth Center is across the alley from where the Sisters of Loretto offered overnight hospitality for Sister volunteers. One of the unexpected gifts I received was the brief opportunity to live and share in an inter-community setting. This proved very important for our evening sharing, and support of each other sustained us in all we were experiencing. Sisters Mary Ondreyco, SNJM, and Mary Becker, SNJM, had arrived the week before and introduced me to all the tasks I would find myself doing for the two weeks. Our role was to welcome 50 to 100 refugee guests each day; help with the intake process; assist with plans for the next part of the guests’ journey; prepare meals; and distribute personal items such as towels and sheets, toothbrushes and toothpaste, and new sets of clothing. We also prepared bedrooms daily, figuring out who was leaving and who was coming. 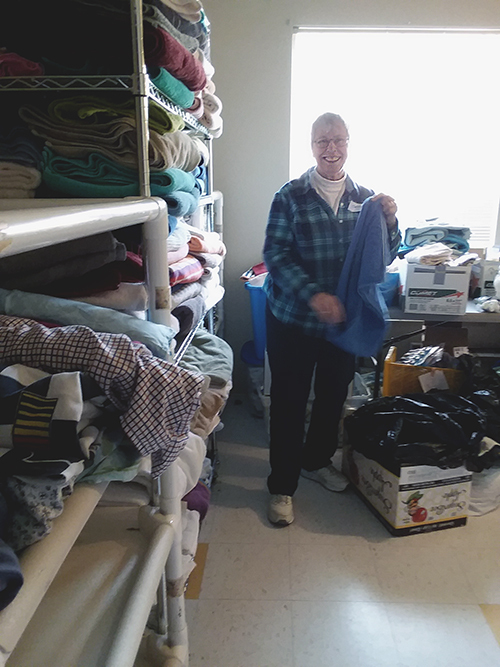 Sister Cathy Olds, OP, works in the towel room, preparing to serve the needs of 50 to 100 new immigrants who arrive daily to Annunciation House. We volunteer Sisters were a small part of those involved in Annunciation House: the full-time daily coordinators, out-of-town volunteers and local El Paso volunteers who provided meals, picked up and laundered bedding and towels, drove people to bus stations and airports, and made donations. The Nazareth Center caters to families who come from various parts of Latin America. They arrive with the clothes on their backs and worn shoes and are hungry and thirsty, often with young children prone to illness. Through all this, they arrive with inner strength and hope. I do not speak Spanish, which was a disadvantage. I was unable to listen to the stories of the guests. However, through a variety of ways, I found that I could indeed communicate while handing out towels and sheets, serving meals, and mopping floors alongside the refugee guests. We had many moments of laughter, and I found the refugees so willing to assist wherever they could. As Sisters, we came with experience, many of us in administration. However, we quickly learned that the only skill we really needed was compassion and a willingness to do whatever was needed at the moment. We set aside our desire to organize and became one with the chaotic and seemingly impossible task of meeting the present needs of those arriving day in and day out. What does one need to be a volunteer at these hospitality centers? An open heart and mind are essential, as well as health, the ability to be on one’s feet for eight hours a day, and a willingness to “hang loose” and just enter into the moment. We volunteers were exhausted at the end of each eight-hour-plus day and indeed slept well. I am most grateful to have had this experience of being with the refugees and those serving them. How will this experience affect or change my life? This is my discernment at this time, for one cannot have such an experience and not be touched deeply. Feature photo (top): From left, a kitchen volunteer, Sister Mary Ondreyco, SNJM, Sister Mary Becker, SNJM, and Sister Cathy Olds, OP, prepare to serve refugees at the Nazareth Center of Annunciation House.